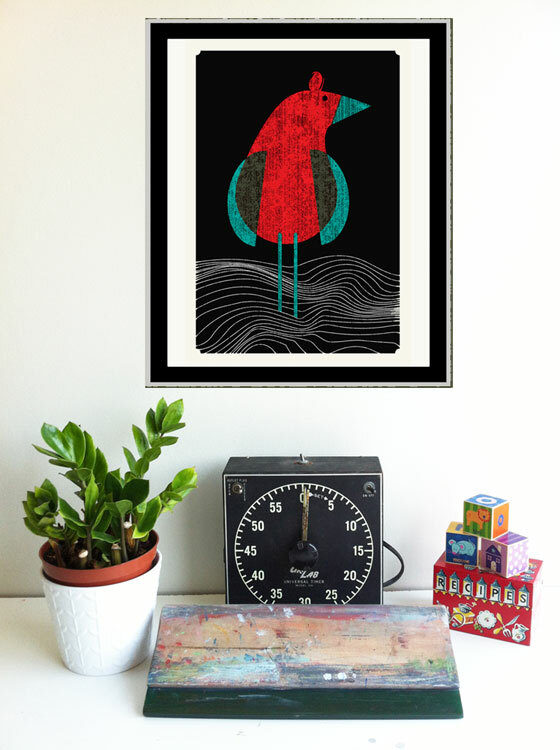 Say hello to our newest silkscreen art print “Seabird” a friendly guide to worlds of air, land, and salty sea. “Seabird” is inspired by Allison’s lifelong love of the sea and mixed with our fascination for feathered creatures, we think our influences show in this silkscreen art print. Always struck by the regal beauty of seabirds and their amazing 3-environment spanning lives in the air, on the land and in the water, “Seabird” is a silkscreen expression of that admiration. Edition: 500, each print is hand numbered, signed and titled. Paper: Archival, no-acid, recycled content, American made Cougar Opaque White, 100lb cover weight. Fits beautifully into either a standard 16″ x 20″ frame by trimming the border, or into an 18″ x 24″ frame as is with a 1″ matte. Each print is hand titled and signed. 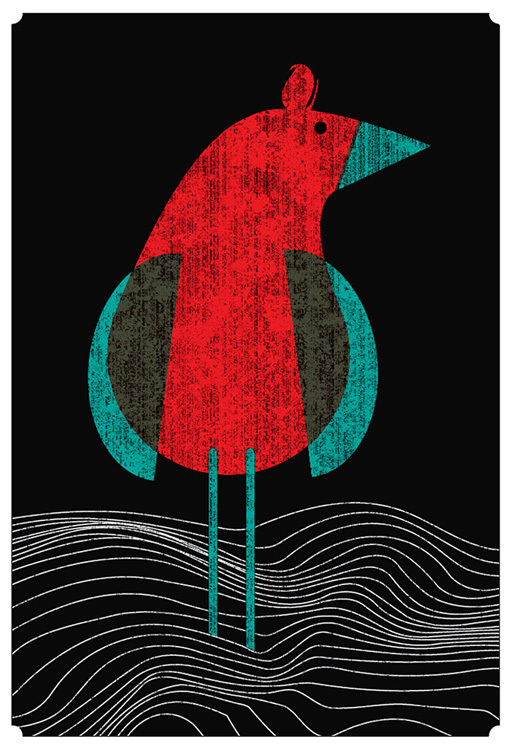 “Seabird” is now available for purchase in our webshop here and also in our Etsy Shop here $25. 2 new giclee prints, Ghost Ship By Day & Ghost Ship By Night, both sold either separately or as a diptych set. Click for info or to purchase prints. As designers and illustrators for hire, we’ve been getting more into more really fun and cool non-silkscreen printed work this year. Sometimes in working on sketches for clients, we get to try out new things, and new styles that wouldn’t always be a great fit for the super labor intensive, one-color-at-a-time method of hand screenprinting as we do with our rock posters and many art prints. Sometimes those sketches move forward, sometimes they don’t. Until now that is. Rather than just let some designs die a slow, sad death in a file somewhere even though we really like the art work, we’ve been mulling over the chance to create a new line of art prints in the form of giclees. And, in a multi-part series of blog posts, we’re announcing their release into the world. Hooray! 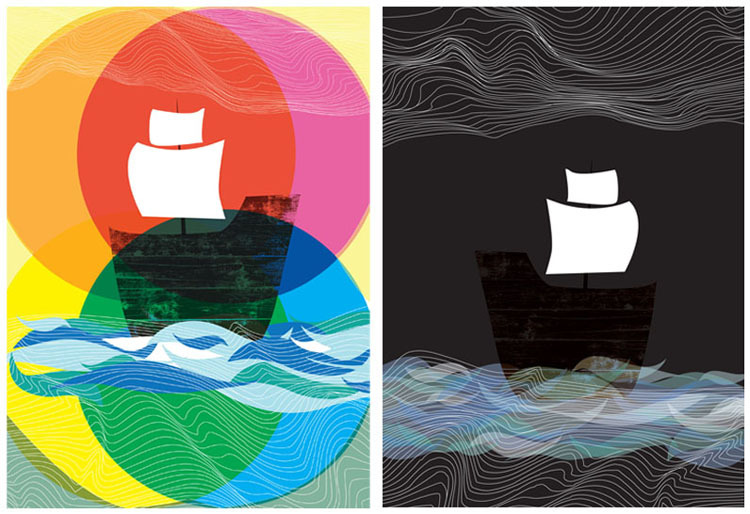 Part 1, Ghost Ship By Day and Ghost Ship By Night, a 2-print diptych set. These 2 prints were designed to go perfectly together, but also are fully able to stand alone as well. Hence, we are offering them for sale either individually for $20 a piece, or as a true diptych set for $35. A nice little deal! 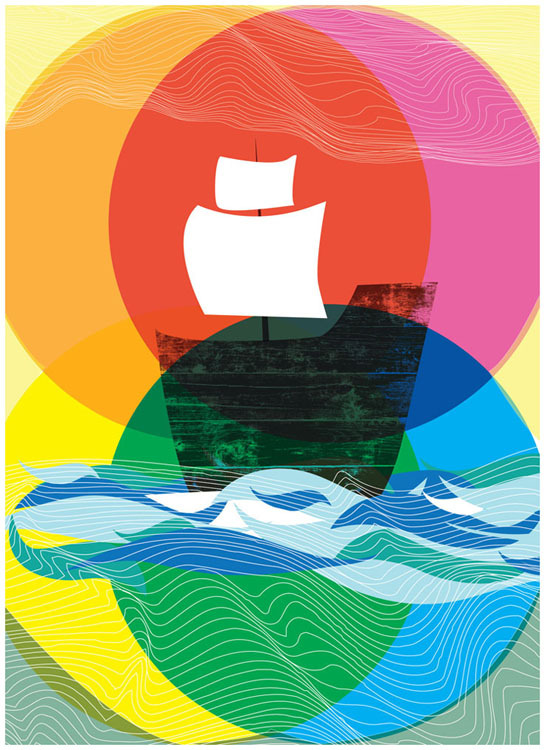 New giclee art print, "Ghost Ship By Day". Click for more info or to purchase a print. I have a thing for Ghost Ships, especially the spooky ones. From reading stories about the famous Marie Celeste as child to The Rime Of The Ancient Mariner, ships adrift without a crew, carried on the whims of the sea and the winds have long fascinated me. In this original illustration “Ghost Ship By Day”, there’s the nice bright, Daylight aspect of a journey. Setting out, high hopes and sun fill this illustration. Below is “Ghost Ship By Night”, the second of a 2-part image showing the Night time aspect of an ocean voyage. 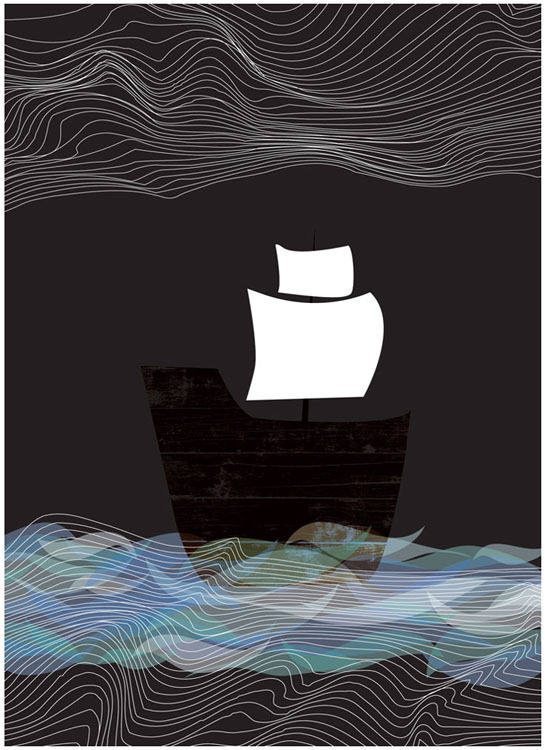 Shrouded in moonlight and mystery, this Ghost Ship print moves ever on alone. Many Ghost Ships roamed the seas alone for months or even years, seeing many suns rise and set in their solitary journeys without a living crew. Both prints are available individually or as a set now at my website here and also in my Etsy shop here. New giclee art print, "Ghost Ship By NIGHT". Click for more info or to purchase a print. New ‘W is for Whale’ Exclusive Desktop Design at Green Eyed Monster released! Green Eyed Monster is an awesome little corner of the web and we’re really excited to announce that we’ve teamed up to do an exclusive release of a desktop background design with Ash & Kimmy from this environmentally forward curated shopping & blog site. Their name is less a term of jealousy and far far more a big nod to the environmental and green ideas, products, and philosophies found within the DIY and Handmade movement. For the month of April, my adaptation of our W is for Whale Alphabet Print design (the original print is here) will be available for free as a download for your desktop all April long. So swim on over, whatcha waitin’ for? Click the below images or click here to get the April W is for Whale desktop background and enjoy a little undersea funscape for a while and feel free to pass it on. This is the beginning of a series of digital background pieces that we’re going to be releasing all through 2011 too. Yep! We just want to make our big world a little bit happier. More designs coming soon. To learn more about Green Eyed Monster, see & shop their products and more, click here. To see all of our hand silkscreen printed Alphabet Prints for sale, click here. Huge thanks to Green Eyed Monster for their super sweet profile about us too, you chicas rock! Click to get my full-sized free desktop design from Green Eyed Monster.